Salt is essential to the body. The sodium in salt helps transmit nerve impulses and contract muscle fibers. It also works with potassium to balance fluid levels in in the body. But you need only a tiny amount of salt to do this — less than one-tenth of a teaspoon per day. The average American gets nearly 20 times that much. 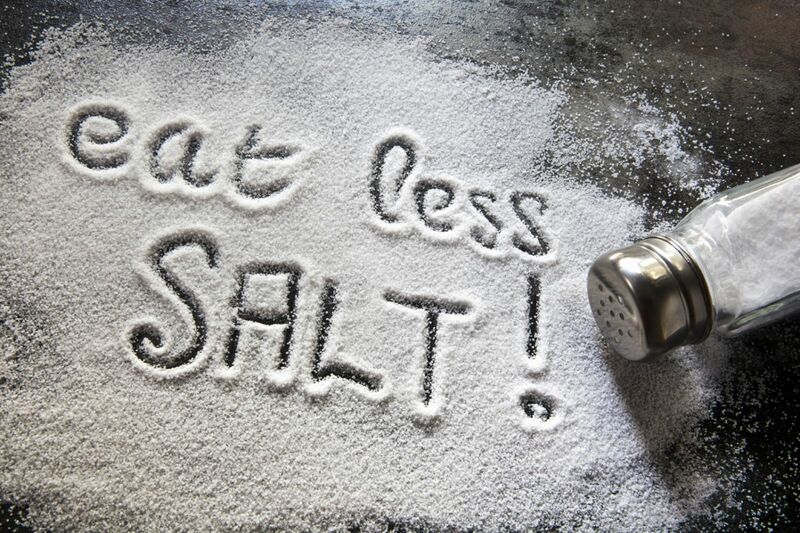 The body can generally rid itself of excess sodium. In some people, though, consuming extra sodium makes the body hold on to water. This increases the amount of fluid flowing through blood vessels, which can increase blood pressure. Use spices and other flavor enhancers. Add flavor to your favorite dishes with spices, dried and fresh herbs, roots (such as garlic and ginger), citrus, vinegars, and wine. From black pepper, cinnamon, and turmeric to fresh basil, chili peppers, and lemon juice, these flavor enhancers create excitement for the palate — and with less sodium. Go nuts for healthy fats in the kitchen. 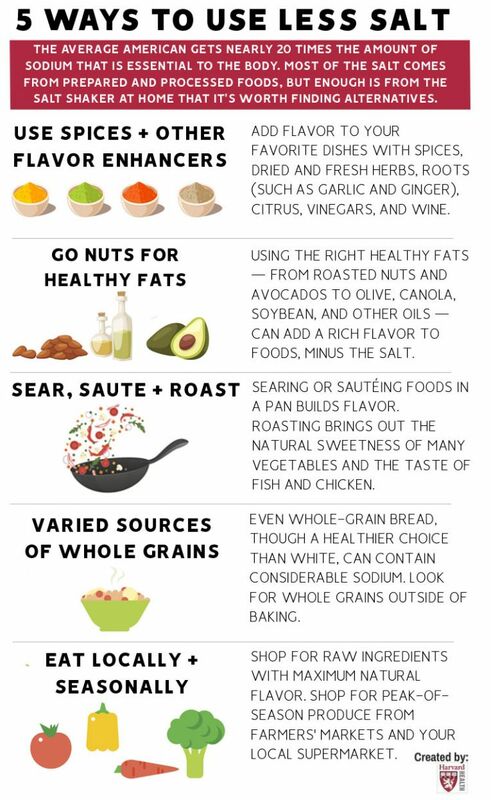 Using the right healthy fats — from roasted nuts and avocados to olive, canola, soybean, and other oils — can add a rich flavor to foods, minus the salt. Sear, sauté, and roast. Searing or sautéing foods in a pan builds flavor. Roasting brings out the natural sweetness of many vegetables and the taste of fish and chicken. If you do steam or microwave some dishes, perk them up with a finishing drizzle of flavorful oil and a squeeze of citrus. Get your whole grains from sources other than bread. Even whole-grain bread, though a healthier choice than white, can contain considerable sodium. Bread contains quite a bit of salt — not just for flavor, but to ensure that the dough rises properly. You can skip that extra salt when you look for whole grains outside of baking. For example, instead of toast with breakfast, cook up steel-cut oats, farro, or other intact whole grains with fresh or dried fruit. Know your seasons, and, even better, your local farmer. Shop for raw ingredients with maximum natural flavor, thereby avoiding the need to add as much (if any) sodium. Shop for peak-of-season produce from farmers' markets and your local supermarket. For more information on lifestyle changes that will help treat high blood pressure, read Controlling Your Blood Pressure, a Special Health Report from Harvard Medical School.